Just because it’s cold outside doesn’t mean you have to put your green thumb to rest. There are many plants that are hearty enough to survive the season’s chill if moved indoors and looked after properly. Such plants include succulents—some of the easiest plants to propagate and care for throughout the year, which happen to adapt well to the indoors. 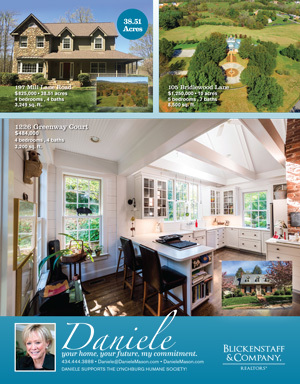 They can be used as centerpieces and focal points throughout your home to add an extra touch of color and texture. 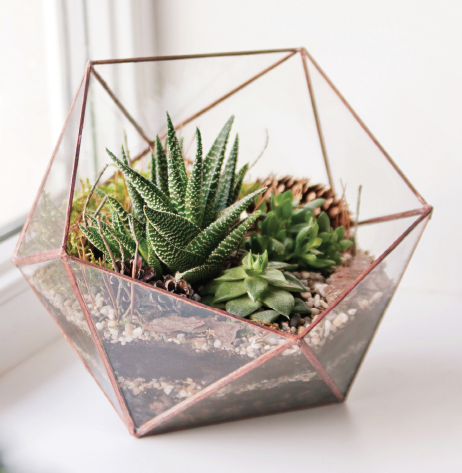 Here are some ideas to create an indoor succulent planter to enjoy as we await spring’s warmth. Succulents are drought-resistant plants that store water in their leaves, giving them a thick and fleshy appearance—a big part of their appeal. These plants are native to deserts, and retain water in their leaves to survive the arid climate and dry soil. While fellow desert dweller the cactus falls into this category, not all succulents are cacti. Cacti typically bear spines and lack leaves. But since both favor similar growing conditions, they work well when planted together. Sempervivum: More commonly known as hens and chicks, Sempervivum comes in many different varieties ranging in color from greens to purples. Sempervivum grows close to the soil with leaves formed around each other. The main part of the plant is the “hen,” and the “chicks” are the tiny buds that start on the main plant and soon sprout their own roots. 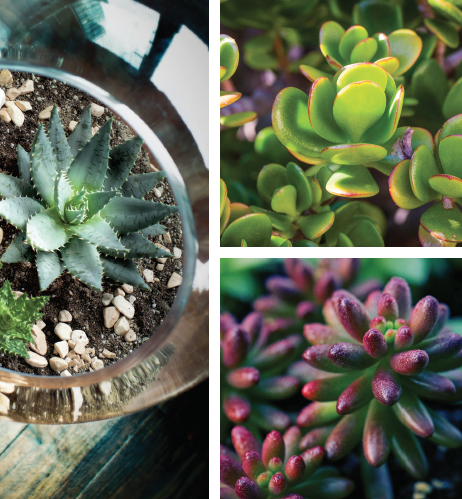 These succulents do best in sun, but will grow in light shade. Aloe Vera: Aloe vera is a type of succulent widely known for its medicinal properties. While green is the most common color, aloe also comes in shades of orange and purple, and in a variety of sizes. These plants require well-drained, sandy potting soil, and do best in bright, sunny conditions. Schlumbergera: Schlumbergera, or Christmas cactus, is a great addition to any succulent planter. Since both succulents and cacti prefer warm, dry weather, they can grow quite nicely together. Christmas cactus have flat stems which resemble leaf-like pads that are joined to one another, and flower in red, orange, yellow, pink, white and purple. Kalanchoe Tomentosa: While most succulents thrive in direct sunlight, Kalanchoe Tomentosa, or panda plant, prefers a mix of direct and indirect sunlight, making it very adaptable for the indoors. The plant’s long leaves are covered in silver bristly hairs that turn rusty orange at the tip of young leaves, and chocolate brown on the tips of older leaves. The velvety appearance of this succulent will give your planter some added texture and a little pop of warm color. Succulents grow well in a variety of containers, so you’ll have plenty of options. The key is choosing the type of container to fit your personal style. Glass hurricanes are both simple and elegant and can add a nice touch of sophistication without being overly pricey. If you’re looking for something a bit more whimsical, you might like to try a glass terrarium. Terrariums tend to be shorter and more circular than hurricanes and can even be used as a hanging planter. With all different shapes and sizes, terrariums can be used as a centerpiece on your coffee table, or serve as a fun addition to any bookshelf throughout your home. Terrariums can be found at almost any home improvement store. 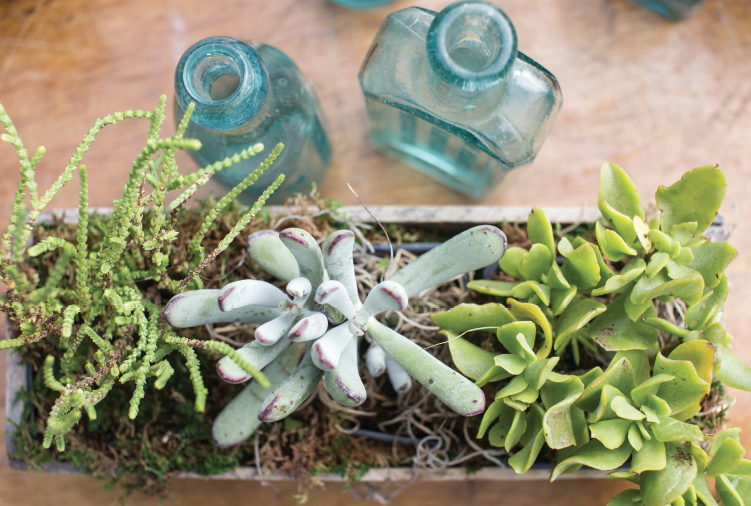 If glass isn’t your go-to, you could try growing your succulents in a flat wooden crate. This will give your succulent planter a more rustic feel. And if you want to go small scale, mason jars work well for tiny succulents. Once you’ve gathered all of the necessary materials for your project, it’s time to get planting. First, start by adding a thin layer (about ½ inch) of small pebbles to the bottom of your container. This will help drain water from the soil and prevent root rot. Next add a layer of soil. When choosing soil for your succulents, opt for cactus soil. Succulents need to be able to drain well, and some regular potting soils hold in too much moisture. Finally, plant your succulents and cacti directly into the soil. Try tucking the plants into the soil rather than packing them in too tightly. The number of succulents you plant really depends on the size of your planter. Succulents can be planted fairly close together and they will grow just fine. The closer the succulents are planted together, the slower they will grow. Succulents will also grow well when spaced a little farther apart (about ½ inch to 1 inch). More space between succulents allows for easier watering and better air circulation. Planting in groups of three is a great way to start. Here are a few things you will want to keep in mind as you work on your planter project. • When it comes to sunlight, remember that balance is key. All plants need sunlight; however, succulents are very flexible and do well indoors. Make sure your plant gets an adequate amount of sunlight and shade. • Don’t overwater! Your succulent won’t die quickly from lack of water, but it does need it from time to time. Hold off watering until the soil is completely dry. You might also like to use a spray bottle to lightly mist your plants, rather than drench them. • Remember to give your succulents room to breathe. Make sure you use a container without a lid so that your succulents can get some air circulation. Succulents are desert plants after all, and prefer a drier climate. • Keep in mind that your succulents will grow and may eventually need to be repotted. With such fun planting projects, there’s no need to let the cold keep you from gardening during the chilly season.